This reader will admit I am a junkie and an addict, for this author's books, as I waited with anticipation for the author next book, it was published and I got my fix. This second book was better then the first. It continues with strong Lea, and her soul-mate, fighting the strigoi, looking for the original five, who were in authority when the curse was declared so long ago. The companions, along with Lea's half sister and Alexander's brothers gathered forces to go hunting and locate their prey to killed them and discontinue the curse. As they bond, they are met with devastating tragedies, which only fuels their anger to complete the mission to extinguish the all generations of strigoi, from the ancient to the present generation. The strigoi go on a rampage and attack the werewolves families and slaughter so many in wicked ways. Alexander loses his loved one and vows revenge, his and his brother sneak off to search and destory the evil, all the way into Hell itself. The author was so descriptive with the scenes and the events this reader was haunted Yet she blended in the love and lust between Lea and Alexander, Lea's sister and Alex's brother, so the reader's mind was stimulated so high and then plunges to the depths of a low, a calming effort, as the love bond etched from the depths of a writer's soul got all four through some graphic Hellish incidents. As they have to pass the dangerous levels and do unnatural actions to rescue their loved ones. Mature audiences, for the scenes in some of the paragraphs were sizzling hot. This story was definitely better, then the first, and it was a high this reader enjoyed, and will look for the third in the series coming in May or June, 2013. I know what I want as a reader for a Mother's day gift. hint, hint, children. 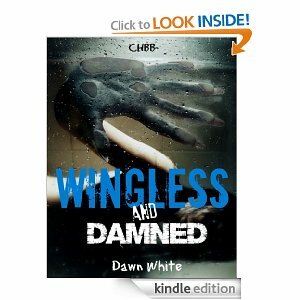 Author Dawn White's Third book, Wingless and Shattered.